Join the KZNSA on Tuesday (May 23) evening at 17h30 for 18h00 for the opening of Elevating The Functional, an eclectic collection by established ceramic artists. Clay transforms, it’s mutable, changeable and permanent. Clay is an expressive material - from the belly of a bowl to the gestural marks of an abstract sculptural piece there is something of interest for those who wish to surround themselves with beauty. The material transforms from a lump of dirt into a myriad of forms. This exhibition by members of the CSA Association celebrates the beauty of the handmade over the machine-made and brings artistic merit to functional items. Work on show - mugs, plates, bowls and platters - become a blend of fine art and functionality. Collectors looking to source the work of well-established ceramic artists will find pieces by Lindsay Scott, Astrid Dahl, Trayci Tompkins, Corrie Hook, Jo-Anne Kuter, Phumlani Nyawo, Frank Nythunya, Carla du Cruz, Carol Hayward Fell, Garth Hoets, Louise Jennings, Lynette Morris-Hale and many other artists. Work on show includes beautiful utilitarian objects and sculptural art pieces. Lisa Ringwood, based in Cape Town, is this year’s invited artist and her work brings another dimension to the exhibition. 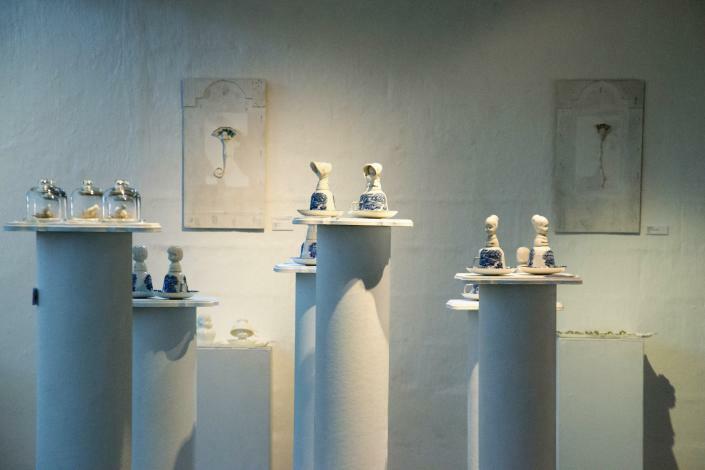 She works from her studio in Kommetjie where she uses hand building, pinching and slab moulding as building techniques, and graffito, coloured slips, oxides and under glaze colours to decorate her work. She draws her inspiration from daily life and nature, painting local birds, fynbos, trees and blossoms. Each piece speaks of an unhurried observation and care, and can trace its organic connection back to the earth from which it was made. She achieves this without subscribing to symmetry or commercial uniformity, giving each piece their unique personality. There is an essence of domestic nostalgia captured in her work – a sense of daily life spilling over into her craft – art and life merging into each other, being inspired by one another, along with the joy of creating something functional. The Ceramic Association has been in existence for over 50 years and its commitment to the art of ceramics has made it a thriving organization.